Sunday January 8th 1893 I was at home all day. Will went over to Clarks this morning to bring Mary home. he found that Mrs Smith had died at six oclock this morning. Jennie Woolf spent the afternoon here. 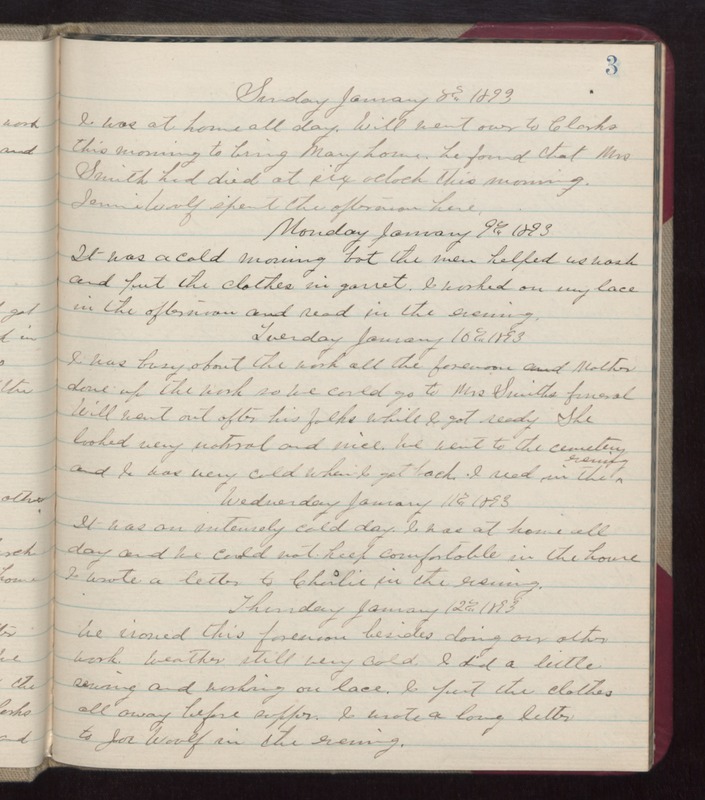 Monday January 9th 1893 It was a cold morning but the men helped us wash and put the clothes in garret. I worked on my lace in the afternoon and read in the evening. Tuesday January 10th 1893 I was busy about the work all the forenoon and Mother done up the work so we could go to Mrs Smiths funeral. Will went out after his folks while I got ready. She looked very natural and nice. We went to the cemetery and I was very cold when I got back. I read in the evening. Wednesday January 11th 1893 It was an intensely cold day. I was at home all day and we could not keep comfortable in the house. I wrote a letter to Charlie in the evening. Thursday January 12th 1893 We ironed this forenoon besides doing our other work. Weather still very cold. I did a little sewing and working on lace. I put the clothes all away before supper. I wrote a long letter to Joe Woolf in the evening.